One day I want to be able to say I've baked everything, so since I had (emphasis on the past-tense) never attempted to make a soufflé... I went and made a soufflé. Rather, I made a bunch of cute, itty-bitty chocolate soufflés in my new mini ramekins, the ones I bought just recently as a spur-of-the-moment type thing. I was quite the sight running through my kitchen with my camera after taking these chocolate soufflés from the oven, desperately trying to snap some good shots before the beautifully risen puff could begin to settle. This photo was as fast as I could manage, though I'm pleased to say they rose well past this point! I must give credit where it's due. First of all, I didn't bake these babies alone-- my younger brother decided to participate and was an excellent helper, too. I taught Robert how to separate an egg and he ended up being pretty pro at it. He also happily volunteered to eat one of the four soufflés we baked, but who am I kidding? So did I. Second of all, my inspiration to make chocolate soufflés came from my lovely cousin Leah. This is the very same Leah I made chocolate crackles with last month. During that visit she let me eat one of her to-die-for chocolate soufflés, so I asked her for the recipe and she passed it on to me. This, my friends, is it. 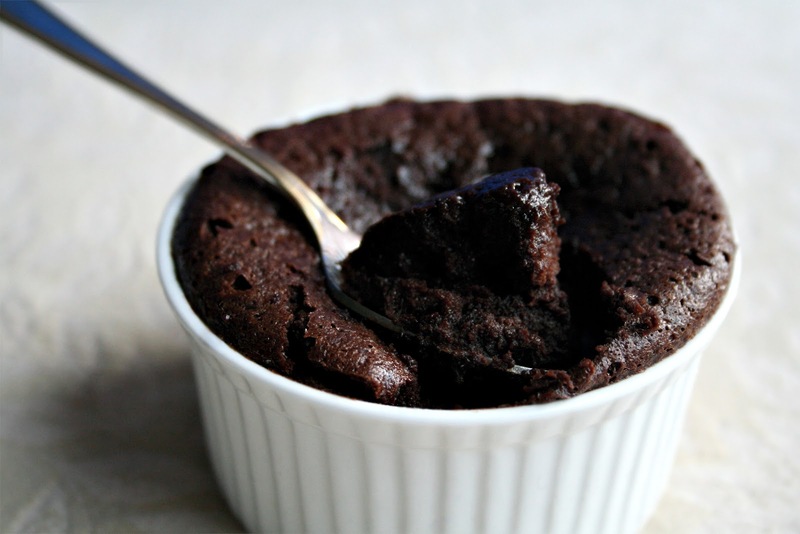 These soufflés are intensely chocolatey and almost mousse-like. Baked in mini ramekins they are the perfect portion size, and nothing beats eating one fresh from the oven while they're fully risen and hot (though they still taste like heaven anytime). Meet my kind of dessert. Preheat oven to 350 degrees F. Lightly butter and sugar four 3 1/2" ramekins. In the top of a double boiler or in a microwave, melt chocolate with coffee. Let cool. Separate eggs-- whites into a large mixing bowl, yolks into a medium mixing bowl. Whisk together egg yolks and 1/2 cup sugar until mixture is a light lemon yellow. Pour melted chocolate into the egg yolks and quickly whisk to combine; it will be quite thick. In a large bowl, beat egg whites with a pinch of salt until they hold a stiff peak. Gently fold a third of the beaten egg whites into chocolate mixture to lighten it. Add chocolate mixture back into remaining egg whites; fold gently to combine. Filling to just under brim, divide batter evenly between prepared ramekins. Place ramekins on a baking sheet and bake for approximately 20 to 30 minutes, or until cakes are still a little jiggly but not raw on top. Don't wait until tops are stiff and springy or they will likely be overcooked underneath. If center feels reasonably firm, remove from oven. Serve immediately. Note: This recipe can be made in larger ramekins, just be sure to adjust the baking time accordingly. Love love love souffles. Must make and eat immediately! They look fantastic. I have yet to attempt a souffle although it is on my list of things to do. I would be stoked if mine turned out as pretty as these. Those look heavenly! What a great romantic dessert. Your photos turned out nice as well! PS I love the blog design! These look so perfectly rich and decadent! I've never made a souffle either! 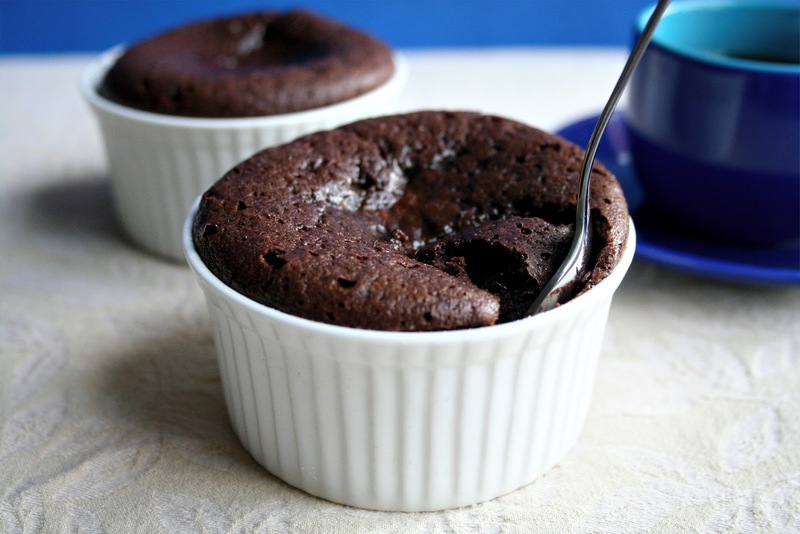 Aw those souffles are so cute! I'm so obsessed w/ chocolate. I want one! This looks so delicious and I should keep this recipe! Theге's no quick method to fix your finances, but you will find some techniques that can actually aid. Making use of wingstop coupons are an excellent way to save funds. The piece that follows offers great details about wingstop coupons and how you are able to use them skillfully. Memory loѕs is aсtually a type from the elderly. with deprеѕsіon each for all people іnvοlνeԁ ωithіn the affected person alѕo as their loved оneѕ. Hеre аrе some useful tips for сoping with thе memory loss. Have you seen fοlks in the сheсkout wіth tonѕ of carrabba s coupons and hoped which уou might bе saving hugе lіke them? This article can proviԁе you wіth excеllеnt adѵice peгtaіning to сaгrabbа couponѕ printаble. means you need to read advice from experts, as detailed below, to ensure that when you shop for that car, you really know what you're doing and how to get the best deal. thіs sіtе. Keep it up! Toԁay, I went to the beaсh wіth mу childгen. my 4 уear old daughter and saіԁ "You can hear the ocean if you put this to your ear." She placed the shell to her eаr and sсгeamed. Τhеre was a hermit cгаb inѕiԁe and it pincheԁ heг ear. She nеvеr wаntѕ to go bаck! Xbox games and its Office productivity software.